School countdown is in the single digits, the temperature is rising and the flip flops are claiming a permanent spot in the doorway: summertime must be (almost) here! And that means swimming, swimming, swimming. I’ve mentioned before that it gets mighty toasty around here (triple digits!) 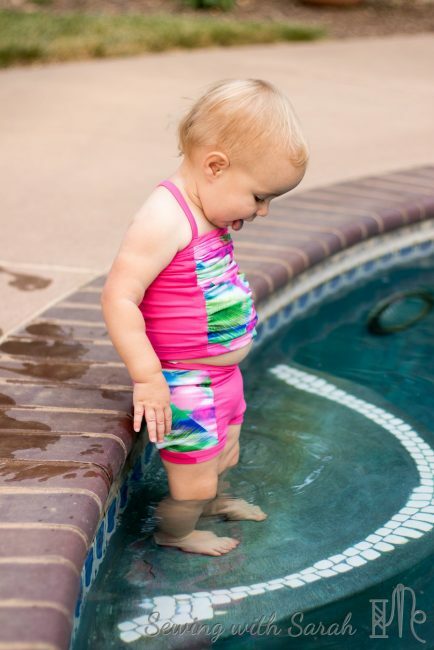 during the summer, so cooling off in the water is a daily survival strategy. We all know what a discouraging experience shopping for a swimsuit can be- they all seem unflattering, too revealing, and poorly constructed (not to mention pricey! ), so I’ve decided to sew my own, and share them with you as part of an awesome group of bloggers bent on making self made swimwear rise to the top of your sewing to do list. Having sewn a couple suits in the last few months, I no longer feel like a total newbie (though there’s still plenty of room for improvement!) and so I decided to tackle a couple new to me patterns: the Jalie Gigi suit for me, and the Peekaboo Marilyn Vintage Suit for Princess. No, I didn’t sew anything for the boys this time around, mainly because when I broached the idea with them they emphatically insisted that they still loved their old suits from last year and did NOT need anything new (they obviously didn’t inherit my gene for shopping/love for new clothes). I’ll wear them down eventually, but for now, that means twice as much fun for the baby and I! I’ve actually made the Gigi bottoms before (here), and I knew I loved the fit. They show just enough cheek to avoid feeling matronly (which is NOT the look I’m going for, at least for another 15 years) but not so much that I feel like I’m hanging out there or at risk of full exposure (yikes). The construction is straightforward, and pretty quick and painless. The Gigi top, however, is much more complex, with princess seams, several options for back closures and a full lining. I opted to omit the cups (I find they always get bunched up funny anyway, and there’s no hiding what nursing 3 babies did to deflate me up top), but I still had about 10 pieces to cut and sew! While this was intimidating, I trusted in Jalie’s clear, concise construction methods, which walked me through. Unfortunately, I found that the back was far too wide for my under bust measurement, which is surprising because Jalie is usually spot-on in fit for me. I had to take it in significantly, pretty much eliminating any space where the straps should go. I ended up sewing them down (again, with a massive amount taken off) just inside the triangle back piece, and it works, but doesn’t look exactly like their pattern picture as a result of my changes. I was also slightly disappointed that the lining peeks out a bit at the top in front. The instructions do have you under-stitch, which should eliminate this problem, but it didn’t. I also tried topstitching, but it didn’t really help and ruined the clean lines of the suit, so I removed the topstitching and decided to live with it, but I recommend either trimming the lining pieces slightly so they roll to the inside a little more, or finding a matching lining color. Its also possible that had I under stitched closer to the edge, this wouldn’t have happened- we will see next time! I do love the thick straps, which feel very supportive, the cute bust ruching, and the opportunity for contrast fabric in the princess seams. I felt very “ready to wear” when I was installing the metal swim hook in the back (always use metal so it doesn’t snap! ), and despite the issues with the lining and the band size I’m very pleased with this suit. The main fabric and pink contrast are both from the Fabric Fairy. I found that her swim knits differ greatly in thickness- these were both relatively thin, and definitely needed a lining. I buy my lining from Peekaboo, but Fabric Fairy carries it as well. Want to know more about where to find swimwear supplies and what you will need? See my blog post HERE on Sewing with Swim: Supplies. For Princess, I made the Peekaboo Marilyn Vintage Suit, which I’ve been eyeing since the testing call. For some reason, most suits for babies toddlers are one piece, which makes absolutely NO SENSE for the diapered set, who might need quick and easy access to change a diaper. Have you ever tried to peek a wet suit off a crying baby/toddler that has just pooped in their soggy swim diaper? If not, count yourself lucky, because it’s no picnic. Separate bottoms make this experience much more tolerable, and I was looking forward to making this pattern so we could be stylish together AND have easier clean up. If the Jalie Gigi top was intimidating in its number of pieces, the Marilyn had me scared silly. I actually asked on the Peekaboo Facebook page whether I really had it right, because I couldn’t imagine so many pieces needed for such a small suit. I was quickly and helpfully answered by Amy, the owner of Peekaboo, who reassured me that they were all needed, as well as a few former testers who assured me that it would actually come together rather quickly. Fortunately, it did- I was able to sew the tops and bottom in an afternoon. I fully lined the suit for comfort, and only ran into difficulty with the gusset. Next time I think I’ll attach the lining and main fabric gussets separately, so all seams are enclosed. If there’s one thing I’ve learned about sewing swim though, its NEVER to unpick swim lining, so this one is staying as is. The fit is great on her, except for the top being a tiny bit short, but I think that’s because of her adorable baby belly, and I don’t mind that cute little belly button peeking out one bit! Since I wasn’t sewing for the boys this time, at the last minute, I decided to whip up another bikini set from a pattern that just released- the Moxi Shorts from Greenstyle Creations! I sized down to make them in swim fabric, and used an athletic knit for the binding and waistband. This is technically not swim fabric, but is still a nylon/spandex blend, so I think it will be OK. I also added the inner brief (included in the pattern) from Swim Mesh. For the binding, I used chlorine proof FOE from Diaper Sewing Supply here (the swim fabric is also from Diaper Sewing Supply), and applied it in a single step, stretching VERY SLIGHTLY. If you do this right, you won’t get any waviness in your seam- its a good idea to practice on some scraps first. The waistband has clear elastic inside, per the pattern instructions, but I think next time I will use power mesh for the inner waistband and eliminate the elastic, which is more appropriate for running than swim. I’m delighted with how this turned out, and was really impressed with the quality of this swim knit from Diaper Sewing Supply. Its nice and thick, similar to what you might get from custom swim, and would be great for beginners. To match my swim shorts, I decided to turn to a pattern I’ve made twice before (here), the Escapade Top from 5 out of 4 Patterns. This top doesn’t get nearly enough love- I was able to construct it start to finish in 1.5 hours, and I really love the supportive fit. The only change I made this time was to stitch in the ditch at the side seams and at the center back to keep the straps from twisting in the channel. I really like this top and think it fits the sporty vibe of the shorts well- you can bet this set will be getting a lot of play this summer! See below for a coupon code for 50% off any 5 out of 4 pattern! We took our photo shoot to a friend’s pool, and had a lot of fun in the process. Here’s me trying to jump on the diving board without actually falling into the water! Unlike this photo shoot or this photoshoot where there was SNOW on the ground and I nearly froze to death, it was finally warm outside, so we were able to take our time and play in the water a bit. Princess had a great time splashing around (she’s such a water baby!) and found the pool loungers the perfect place for a (totally fake) nap. As usual, she had to have a snack during our shoot, and I was happy to oblige (all suits must be nursing friendly for us!). There’s no swimsuit in this picture, but how can you resist those big eyes? So, what do you think? Would you sew your own swimwear? What is lacking in ready to wear swimsuits that you could fix with your own version? 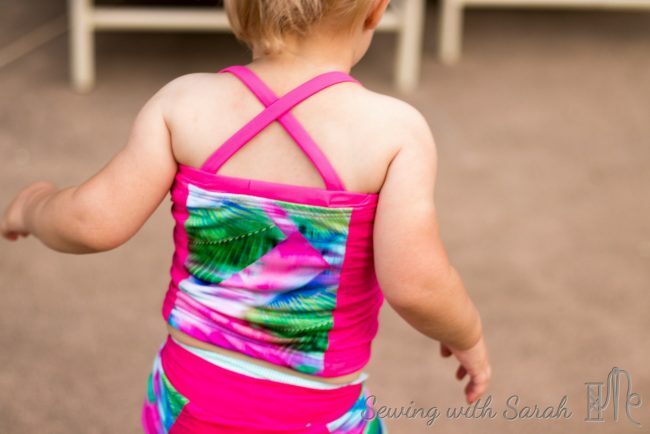 To get started, check out my blog post (the first in my swim series) on Sewing Swimwear: Supplies. Happy Note: All patterns from 5 out of 4 are on sale for 50% off through 5/29 with the code MEMDAY17- grab them quick HERE! 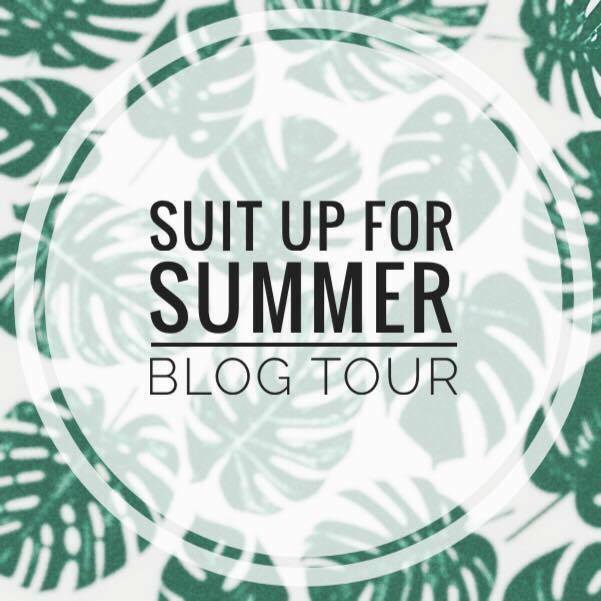 To help get you thinking and planning your own self-made swimsuit, Sew Sophie Lynn and Paisley Roots are hosting an amazing giveaway. Head on over there to enter! You could win a $25 gift certificate to Raspberry Creek Fabrics, a $25 gift certificate to The Fabric Fairy, a $25 gift certificate to Peek-a-Boo Fabric Shop, and a $20 gift certificate to Simply by Ti. 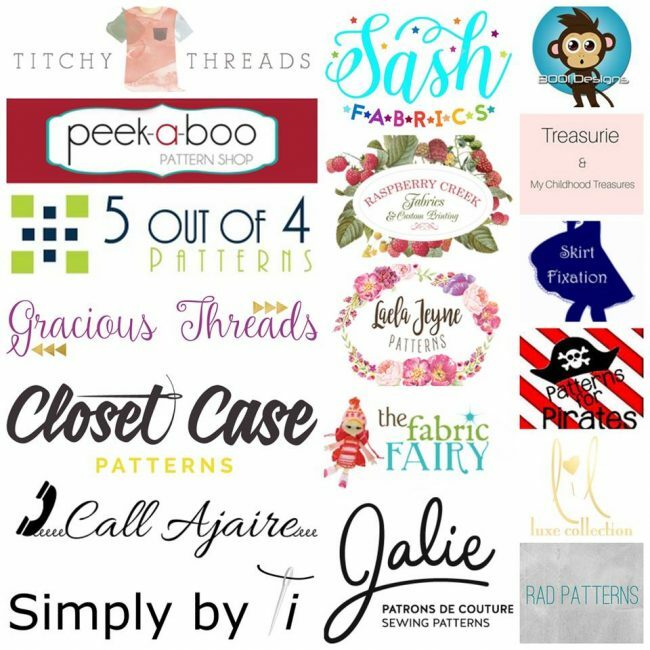 You could also receive a pdf pattern of your choice from Closet Case Patterns, Jalie, Gracious Threads,Lil Luxe Collection, My Childhood Treasures, 5 ouf ot 4 Patterns, Titchy Threads, Call Ajaire, Rad Patterns, and Boo! Designs! Thank you so much for stopping by, and don’t forget to follow along (or catch up!) with the other stops on our tour below! These matching suits are just too cute. And those shorts are totally on my “to buy” list. You look amazing and I love hearing all about your sewing process. I’m so glad you were able to work with your Gigi top because it really looks amazing! Your fabric choices are perfect for summer too! Thank you! I feel ready for the pool. The Gigi is a really great pattern- I’m glad I was able to work with it too. Its all a learning experience right? She’s so cute!! I love that suit with the ruching on her. I’m all about snack friendly suits too haha! Awww, LOVE the nursing pictures. <3 <3 I'm missing that, and only a few short months ago, I didn't think I would ever not be nursing. Haha! And you are so talented, all your suits look amazing! Thank you! I love nursing her- its so much less stressful than it was with the twins! So much fabulousness in this post! Love the fabric! Love the pattern choices! Just heart eyes from me all around! Thank you Abbey! They were really fun to create! Thank you! I’m going to keep making us matching clothes until she tells me not to! Cute suits and helpful information. I made the Jalie swim top for my granddaughter age 7 and found as well the bottom band much too big along with lining on top rolling out. We are just living with the lining peaking out since its just under front part of arm. Back looks similar to yours with the amount taken in. Appreciate the tip on metal hooks as had not thought about breakage. Also, going to make this top for myself and will not use the soft cups since you find it works without. Thank you so much for sharing your experience- it’s helpful to know that I didn’t do something wrong- that maybe this is the way the pattern was drafted. I think trimming down the lining may fix the rolling issue, and next time I’ll shorten the band before cutting so I don’t have to take it in at the back. For smaller busts, I think no cups is totally fine- I don’t miss them! I don’t like wonder tape normally, but the bit about using wonder tape to hold the slippery pieces together was a brilliant tip! It saved my swimsuit making sanity! !